What makes this particularly absurd is that the vast majority of the deaths can easily be prevented. Non-steroidal, anti-inflammatory drugs (NSAIDs) carry a huge death toll, primarily by causing bleeding stomach ulcers and myocardial infarction, and most of those who die could have done well without drugs or by taking paracetamol. The idea that NSAIDs have an anti-inflammatory effect has been disproven by placebo controlled studies (4,5). Antidepressant drugs are another major killer that people could do well without. Their effect on depression is questionable (2). The standard outcomes are highly subjective, e.g. a score on a depression scale, and it is therefore important that the trials are adequately blinded, but they aren’t. Most patients and doctors can guess whether the drug is active or placebo because of the drugs’ conspicuous and common side effects, and if atropine is added to the placebo to blind the trials better, the effect disappears (6). Many other drugs that likely have no true effect, e.g. anticholinergic drugs for urinary incontinence and anti-dementia drugs, also have cerebral side effects and can kill patients (1,2). Most of the deaths are invisible. People get myocardial infarctions and hip fractures even without drugs, and general practitioners have no idea that they kill on average one of their patients every year. There are simple solutions to our deadly drug epidemic. Make fewer diagnoses, prescribe fewer drugs and tell the patients to read the package insert on the internet. Then they might never take the drug. Many years ago I did research on naproxen and when I read the package insert and realised in how many different ways this drug could kill me, I decided never to take an NSAID. A life without drugs is possible for most of us most of the time. 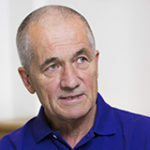 Peter C Gøtzsche is a Danish physician, medical researcher, and leader of the Nordic Cochrane Centre at Rigshospitalet in Copenhagen, Denmark. He co-founded, and has written numerous reviews within the Cochrane Collaboration. He is the author of a number of books on evidence-based medicine, including references in this blog. Peter will be talking at Evidence Live 2016 on the subject of Too Much medicine. 1. Gøtzsche PC. Deadly Medicines and Organised Crime: How big pharma has corrupted health care. London: Radcliffe Publishing; 2013. 3. Coupland C, Dhiman P, Morriss R, et al. Antidepressant use and risk of adverse outcomes in older people: population based cohort study. BMJ 2011;343:d4551. of acute ankle sprains]. Ugeskr Læger. 1986; 148: 1266–8. placebo controlled NSAID trials. J Clin Epidemiol. 1990; 43: 1313–18. 6. Moncrieff J, Wessely S, Hardy R. Active placebos versus antidepressants for depression. Cochrane Database Syst Rev 2004;1:CD003012.